This text challenges the traditional view of the history of econometrics and provides a more complete story. In doing so, the book sheds light on the hitherto under-researched contribution of French thinkers to econometrics. Fascinating and authoritative, it is a comprehensive overview of what went on to be one of the defining subsets within the economics profession. 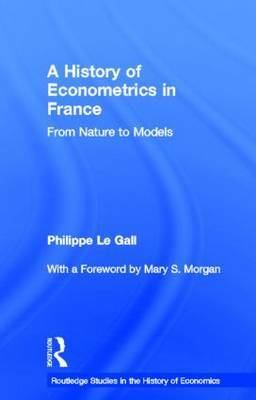 Le Gall explains how econometric ideas developed from, and were inspired by philosophical worldviews and scientific paradigms from the nineteenth century. Exploring the methodology of French authors like Cournot, Briaune and Regnault he demonstrates how they were influenced by the natural sciences of their time, rooted as they were in a worldview where natural order and laws played a central role and how, when an organized discipline emerged at the start of the Twentieth century, these econometric ideas intermingled with new worldviews associated with the complexity of the economy. This book is essential reading for postgraduate students and researchers in the history of economic thought, economic methodology and the history of science as well as econometricians at all levels.